Raising $205m in an oversubscribed series C funding round last year, Nikola Motors has become somewhat of a poster child for the fuel cell commercial vehicle (FCCV) market. Whilst fuel cells remain expensive to manufacturer, Nikola Motor’s recent land purchase in Arizona for its manufacturing facility along with its 13,000 pre-orders highlights the levels of investments being made in fuel cell technology as it aims for a $1bn funding round this year. Based on our latest report, we forecast that 45,000 FCCVs will be delivered annually by 2025 (figure 1). Despite its success, Nikola Motors is facing an uphill battle. 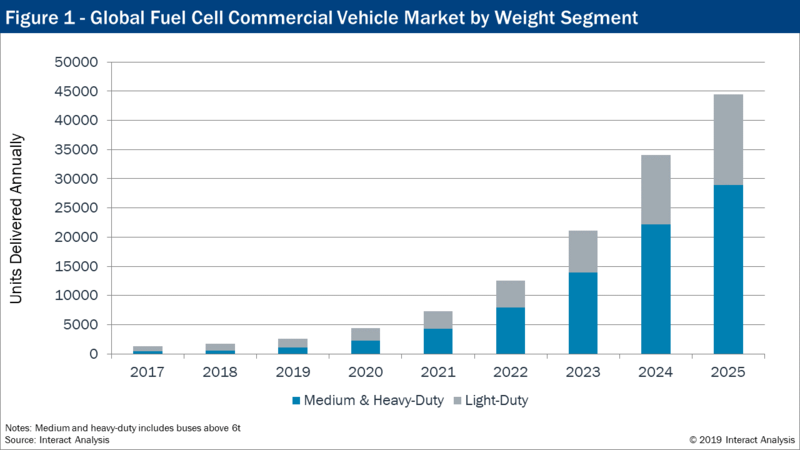 It’s looking to disrupt a historically conservative freight market, faces competition from rival electric truck manufacturers, and is using hydrogen fuel to do so, a notoriously expensive technology with many challenges. However, support for the use of hydrogen may come from the off-highway and marine sectors, driving uptake. In March 2019, it was announced that GE’s Power Conversion business and Nedstack, a leading fuel cell manufacturer, are collaborating on developing hydrogen fuel cell systems for powering zero-emission cruise vessels. The two companies have, to date, developed a concept for a 2MW hydrogen fuel cell power plant on an expedition vessel. Testing power plants of this scale is essential to fully maturing the technology and could have benefits for large power stacks used in commercial vehicles. In November 2018, ABB and SINTEF announced they are testing/modelling the technology needed to scale fuel cell power technology such that it can be used for main propulsion power in commercial and passenger ships. The testing methodology, to be developed at SINTEF Ocean’s Trondheim-based laboratory, will use two 30kW fuel cells, set up to model the operation and control of a complete marine power system in a megawatt-scale propulsion plant. ABB’s own software together with SINTEF Oceans vessel simulator capabilities will imitate and play back different load profiles and diesel/battery/fuel cell combinations, tested in a scaled down laboratory environment. Another key objective will be establishing how to enhance the control of fuel cell plant in combination with energy storage, and how to optimize efficiency, reliability and the lifetime of fuel cell stacks. These large marine projects will help to drive down the cost of large hydrogen fuel cell stacks and also ‘prove out’ the technology for more demanding applications. This will likely be a boon for the heavy-duty truck market in years to come. Energy density. For the largest machinery types or those with the most intensive duty cycles, battery electric solutions cannot support the necessary power requirements. Remote power. Off-highway machinery is often used in locations that have limited or no access to the electricity grid, prohibiting the use of electric machines. If these machines are ever to be electrified (if required by emission policy), then hydrogen fuel cell technology is likely the best option in terms of proving the necessary energy density. For remote sites, hydrogen may also play an important role, either for the generation of on-site power or for powering machinery directly. In the same month, Taylor Construction Plant (TCP) partnered with Intelligent Energy to develop a hydrogen fuel cell power generator for on-site power generation at construction sites. It’s capable of supplying 1000W DC or 5kW with an inverter. 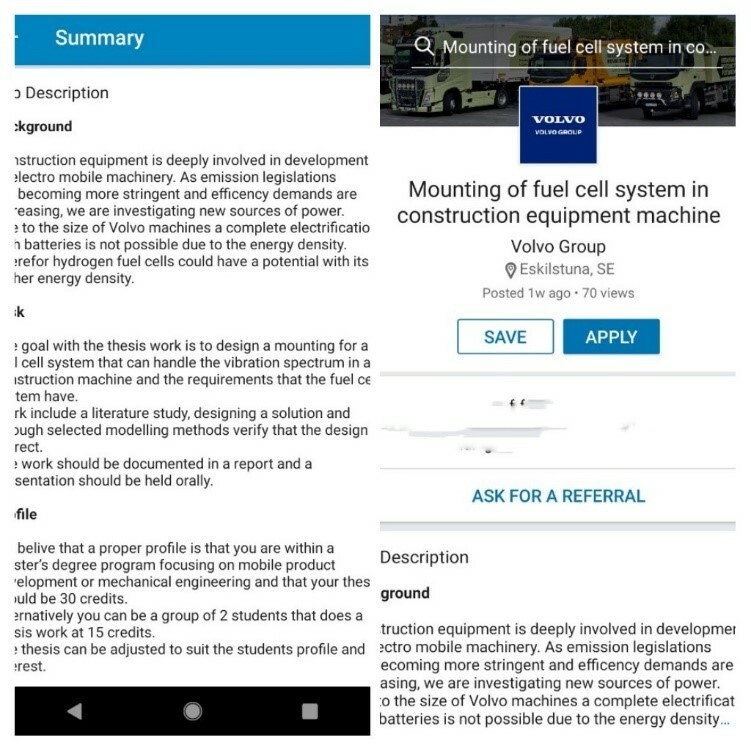 SINTEF is involved in a partnership with NASTA (and others) to develop a zero emission excavator that can be operated on hydrogen. Interact Analysis > Intelligent Automation > Commercial Vehicles > Is Off-Highway & Marine Fuelling Hydrogen Adoption for Heavy Commercial Vehicles?